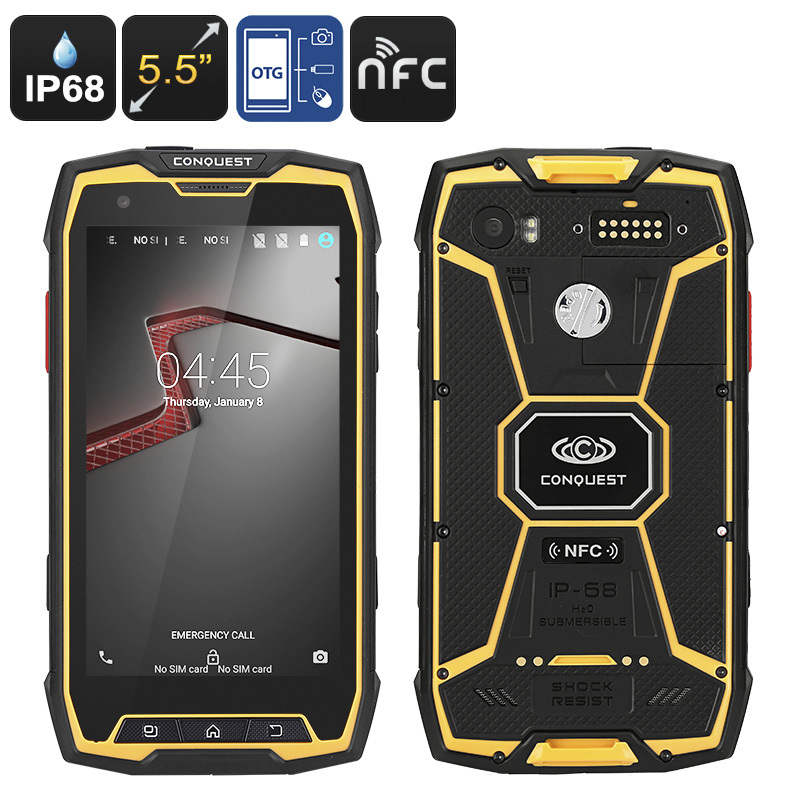 Successfully Added Conquest S9 Rugged Smartphone - Android OS, IP68, Octa-Core CPU, 5.5 Inch Display, 2GB RAM, OTG, NFC (Yellow) to your Shopping Cart. The Conquest S9 smartphone takes the definition of a rugged phone to an entirely new level. Featuring an abundance of sensors and IP68 waterproof certification this Android smartphone is the ultimate outdoor companion to bring along whenever you’re headed out into the wild. A large 5.5 Inch FHD IPS Display provides you with sharp and clear images even in bright sunlight, ensuring that your smartphone can be used in any weather condition. Rain, snow, dust, or excessive light – nothing will stop you from using the Conquest S9 smartphone during your upcoming adventure. Not only tough from the outside, this Chinese smartphone features a massive Octa-Core CPU and 2GB or RAM, providing you with all that’s needed to enjoy the latest and most demanding software without dropping a frame. Its Adreno 405 GPU additionally provides clear and beautiful graphics, allowing you to enjoy media and games in stunning beauty on your 5.5 Inch 1920P display. So head out to the Play Store and download the latest Apps, movies, games and more – with the Conquest S9 you will never again experience a single moment of boredom. Offering up to 32GB of internal memory and providing the possibility to add another 32GB externally you can be assured that this phone holds enough storage for you to save and carry along all your personal files. An epic 6000mAh battery offers up to 10 hours of continuous usage time and an astonishing 480 hours of stand-by time. The next time you head out on an adventure you can leave your home with confidence as with this rugged smartphone you can be assured to be always within reach to your friends and loved ones. Additionally, this smartphone features OTG technology – allowing you to pair it with other external hardware devices or to use it as a power-bank to charge other electronics in the case of an emergency. With its IP86 rating, the Conquest S9 rugged phone is completely resistant against water, dust, and shocks – making it an extremely durable device. Featuring numerous sensors, this Chinese smartphone is the perfect tool for any outdoor enthusiast that likes to enjoy the outdoors yet, at the same time, likes to stay connected to friends and family back home. For those of you that are searching for a smartphone that can take a hit and will follow you no matter how tough life gets, the Conquest S9 is the ultimate choice.